Christian Dior Miss Dior EDT is a light, charming fragrance for young girls. 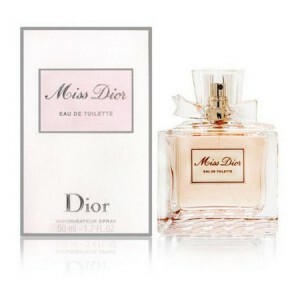 Christian Dior Miss Dior EDT 100ml. is a romantic musical piece, with a soul played on the piano. In it, the maestro has invested all his heart, his experiences and emotions. Breathe in its aroma and enjoy the floral, chypre shades. They will remind you of the brightest moments, awaken in you the highest feelings and give an inexhaustible supply of love for life. The introduction of the composition will be heard by the voluptuous notes of Neroli. It will easily and carelessly pass into the main part - majestic and intoxicating. Here your sense of smell will come to full delight from the aromas of the petals of the Turkish and Bulgarian roses. The end, which will break hundreds of applauses, will be exotic Indonesian patchouli. The new fragrance, eau de toilette - a slight variation of the stroke chypre Miss Dior. Chypre chord now sounds like never assertive and enthusiastic easily encouragingly as the renewal of spring. Touch of fruity notes in the heart floral bouquet gives a sense of the joy of life dazzling desire. Fragrance Miss Dior inherited the idea of Miss Dior, he re-interprets the elegance of Parisian women, known for their charm and love of life. Color flavor in the bottle has a new shade - romantic pink! Fragrance for dazzling mood Joie de Vivre or the joy of life in Dior! Date fragrance: floral, chypre fragrance Top note: neroli note "Hearts": Bulgarian rose, Turkish rose Base notes: Indonesian patchouli.